A sharp lawn mower blade will make a clean cut, leaving a deep, green over your lawn. 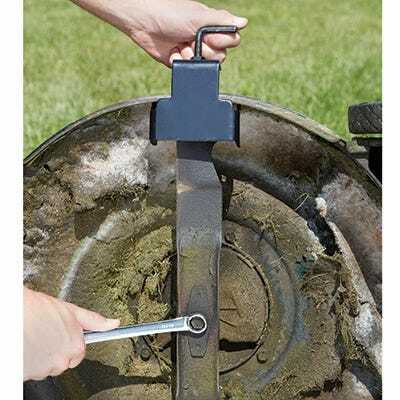 Our universal Lawn Mower Blade Holder provides a safe, secure way to hold your lawn mower blade stationary when you remove it for sharpening. For use with both push and riding mowers. Solid steel construction. 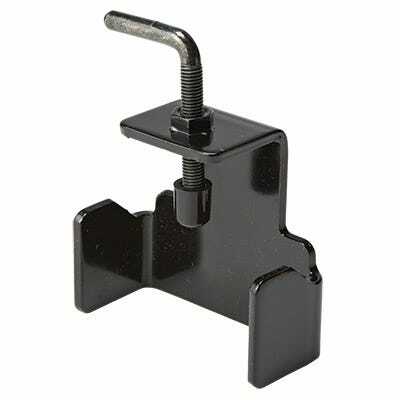 The blade holder makes changing a lawn mower blade easier and safer, but you have to wonder why lawnmowers don't come with these as part of the sale. Works like a charm!! Makes removing a mower blade very safe and easy. Great Idea! Makes it very simple to change blade. No more trying to hold blade, or wedge a wooden block to keep blade from turning. Thanks for the review, Carol! I used the wooden block method for years until the wood slipped a few times, this Blade Holder makes keeping the blade stationary a lot more safe. Thanks again! Whoever invented this gadget is a genius. For years I have been using a block of wood to block the blade. This tool works so much better. I could have used it 30 years ago..
Drew, I used the block of wood as well and have since retired it to a wheel chock. Thank you for the review! Who ever came up with this tool was absolutely brilliant and knew exactly what they were doing. Wish that I had had this some time ago. Saves ware and tear on my old body. Much easier to keep the blade locked in place, rather than blocking other ways or trying to hold it in place while trying to release the locking nut. Simple, Rugged, Inexpensive, and Effective!! Although it may be tempting to concoct some blade-jamming device from that pail/can/box of odd parts and leftover pieces most of us have lying around, STOP!! Do not waste your valuable time. This simple, rugged device works perfectly, and it will allow you to complete the job without scaring off the children or stopping for band-aids. Thank you for the review, Kenneth! We love how easy and safe it makes removing the blade from our push mowers. How can you do without? Quick and easy tool to add to my workstation. Instead of using a block of wood or other makeshift device, this tool locks onto the side of the mower housing and allows one to have the blade off in a flash. Definitely a time and work saver.